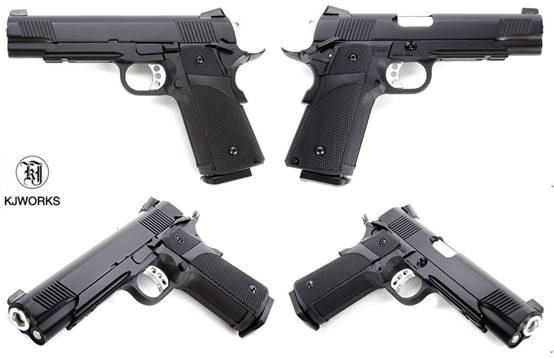 First introduced by Marui 10 years ago and was basically modified from M1911, Hi-capa was probably the most welcomed model not only because of its capacity of double-feeding magazine, which is twice more than M1911’s 7+1 rounds, but also its various upgrade kits overwhelming consumers’ attention. Optical fiber combat sights, light-weight construction in trigger and slide are beneficiary to rapid shot both in AIPSC race and war-game field. To increase the precision and stopping power of shots hitting on marks, extended barrel is common (thus 3.8 and 4.3 is less popular than 5.1 in race guns) to professional shooters. To compromise the weight and blow-back time issue due to long slide, split or “skeletonizing” slide is a good solution. Sometimes even a muzzle compensator is applied upon Hi-capa to shorten the time interval of sequential shots, although it is believed to be more uniqueness in appearance than practical purpose in AIPSC. Jia Dyi also provides KWC CZ75 TS replica,【KCB-89AHN】,which was built a scope mount in factory settings, but it can’t match the scale to rage war against WE and KJ. People regard KP-05 as a modern version of M1911 government. Except for lacking of authorized carvings, it owns most of the MEU characteristics from the SOCOM– beavertail grip firing safety, light-weight reinforced trigger, adjustable intuitive front and rear sights, anti-slippery carving in both sides of front slide, and the rail beneath the frame. KJ also provides CO2 version named【CP228】, both own black and OD painting【GP228】. WE has made a major leap since 2015 regarding its Hi-capa series. Not just the internals but also the exterior finishing both bring a whole new scene. WE Hi-capa 5.1 Force series is the best seller and it leave the opponent way behind the rear light. Optical-fiber aiming sights, stealth black and fine two-tones finishing enhance the spectacular sight-feast. Another masterpiece of KJ in terms of shooting performance, this version with prolong inner barrel will bring better grouping precision. Although KP-06 owns a lighter aluminum trigger and optical-fiber sights than KP-05, KJ provides extra aluminum scope mount as an option for KP-05/-06 hi-capa series if shooters want to install personal scope. We also provide OD version,【GP229(OD)】. When it comes to competition guns, every second counts! Although long barrel gives its advantage in precision shooting, WE has figured out a way to shorten the slide moving back-forth and decrease the muzzle bumping– cutting the slide and “skeletonizing” it. Notice the outer barrel did not expose when its slide was in back! Though it may not be shown in real arms, but that’s the fun of AIPSC, isn’t it? WE also provides three colors of slide painting-blue, red, and black in T-Rex custom Titanium barrel version. 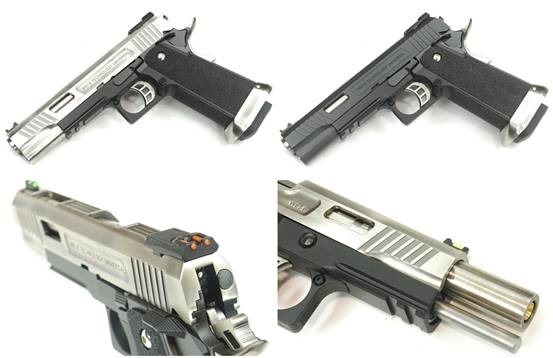 Speaking of competition guns, WE has built a stronghold in Hi-capa proliferations by versioning strategy, but there are more can be chosen in WE portfolio, like Springfield’s XDM-IPSC, and G_lock’s G_34 clones. As usual, we list WE XDM-IPSC because we can offer XDM scope mount,【WEUP-35】in black, and【WEUP-36】in silver. If you don’t like the broad grip like Hi-capa or thick one like G_34, the XDM fits for small palm shooter. Note its muzzle compensator! Competition gas guns in AIPSC often encounter a dilemma, rapid shooting in short time easily induces gasification issue if player didn’t pay attention to internal construction. 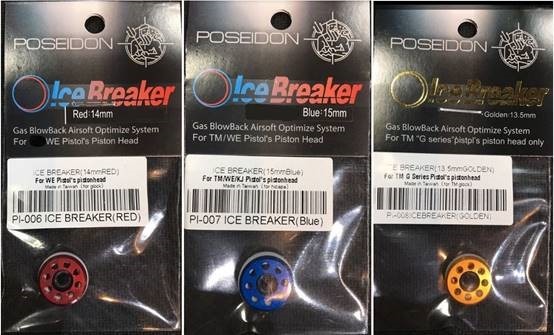 Replace the original gas guide valve and spring inside the nozzle set with ICE PICK®,【AC-POS-PI001】, and substitute the piston rubber bowl with ICE BREAKER®, the problem due to hypothermal issues will be swept away. For WE Hi-capa after 2015(and of course including M1911), XDM-IPSC, and clones of Beretta M92, S&W M&P9, SIG P226,Colt PX4, Walther P99,even Marui FN57 should use 15mm【AC-POS-PI007】,the blue aluminum piston. 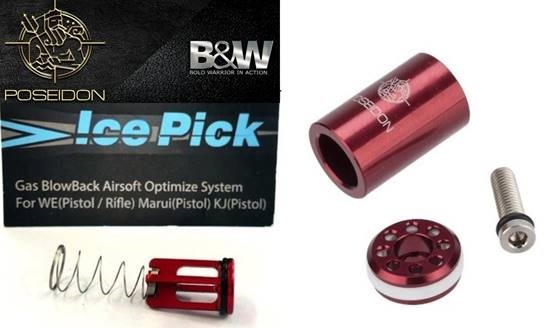 For WE G-family, and Hi-capa before 2015(old M1911), use the【AC-POS-PI006】red aluminum piston. Golden piston,【AC-POS-PI008】is for Marui G-family. As for guns that have been upgraded with AA/CP conversion kits,【AC-POS-PI009】is recommended for there’s an extra sleeve. 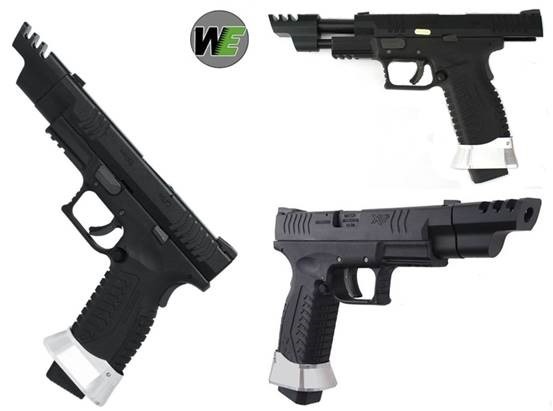 KJ (including CZ series suitable for competition guns, click to check!) and other brands need to measure the diameter of stock part to decide the suitable upgrade kit. Last word：Standalone ICE PICK®【AC-POS-PI001】has significant improvement even installed in gas guns(including GBBRs) for all brands. Jia Dyi again presents its capability in “turn-key” solution, from plain pistols to suitable upgrade kits. We believed there is more to be explored in our agent products, contact us today at sales@jiadyi.com to start a constructive dialogue to set up your professional sale offerings.